This is a collection of beadwork pendant and earrings projects and patterns that have proved popular with crafters. Since pendants and earrings can both be made with similar components (make one for a pendant, two for earrings), this project list includes components suitable for either use. This is an all time favorite of mine - simple but sticking circular brick stitch decorates a plain metal component. Quick and easy to make, but a classic necklace that never goes out of style. Spiral stitch is one of the easiest and strongest beadwork stitches. The resulting rope chain is perfect to use for amulet bags, pendant necklaces or purse straps. These earrings combine tubular peyote stitch with beaded tassels for elegant and versatile earrings that are always in style. Even count peyote bead tubes make great earrings when you add a fabulous spiral pattern. These step by step instructions will help you understand the stitch and how to read the pattern plus assemble the earrings. Stitch up an even count peyote tube bead to add to your next jewelry project. These components can be used in earrings, like the Spiral Peyote Tube Earrings or in other jewelry projects. Break out your wire and pliers to make these beginner level teardrop wire earrings with coil decorative accent. This is a great project to start exploring wire jewelry making. This project uses tubular peyote stitch to surround a tusk or claw bead with peyote beadwork. The same technique can be used to decorate crystal points or other round stone or beads and then make pendants or earrings. Lark's head knots are perfect for attaching pendants, but they can also be used to cover metal rings to make components for your jewelry projects. Tie one on today. Whether you are new to wire wrap jewelry or not, these earrings are quick and easy to make with basic wirework tools and a few gemstone beads. Metal hoops surrounded with brick stitch and attached to earwires with beaded flower details. This project will teach you to connect beaded components and make pretty spring earrings. These rosary prayer beads are made with traditional simple wire loop construction in the most popular rosary bead configuration. Learn more about rosary beads and how to make your own for prayer or fashion. 108 Bead Mala made with pink and rutilated quartz beads. Tibetan Japa Mala prayer beads have 108 beads arranged in one of several configurations, often with a tassel or other decorative embellishment. Learn how to make your own with this stringing tutorial. This necklace may look complicated - but it's not! Simple wire jewelry skills like open wire loops and wire wrapped loops combine to make a dazzling pendant attached to a simple wire and bead chain. Beaded spiders dangle from a beaded thread in earrings, pendants or even as table decorations during Halloween. And don't forget Christmas Spiders that hide in the tree! These fun arachnids are a great way to bust your bead stash. These wire frame components from Beadalon make wire wrap a little easier. Learn how to make a mosaic gemstone pendant with store bought frames and wire. Swish! Chain and beads combine for a new type of tassel - with a unique double layer for extra movement. Learn to make this versatile wire wrapped bead chain the FAST way! This wire and bead chain is perfect by iteself, with a pendant or as part of any jewelry making project. The best part is that using this technique you can make the chain up to 50% faster. 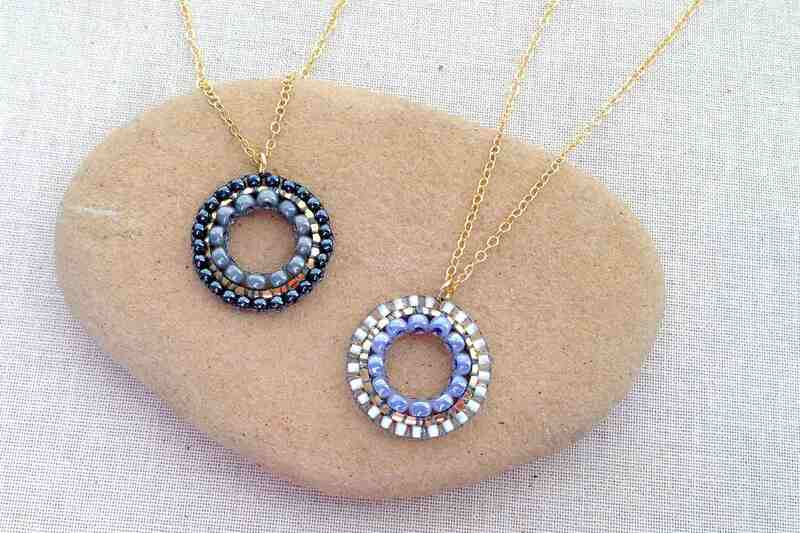 Use multi-hole connectors in a new way - to make this fun pendant necklace. Whatever beads you choose, it is sure to be a hit. Flower power all the way - this great daisy component uses brick stitch to make a fun component perfect for pendants or earrings. Any drop beads will work - but the distinctive yellow and white scream daisy all the way. Two round beads and a foot of 20 gauge wire and you can make these earrings in a few minutes! Wrap some up today. This tutorial will show you how to select and manage circular brick stitch around a drop bead. The trick is in choosing the right bead to wrap and keeping the beads cenetered around the focal bead. Wrap up some store bought hoops and make them match any outfit.